ThinkFree Calc (www.thinkfree.com), like its ThinkFree Write sibling, is a Java-based online application. 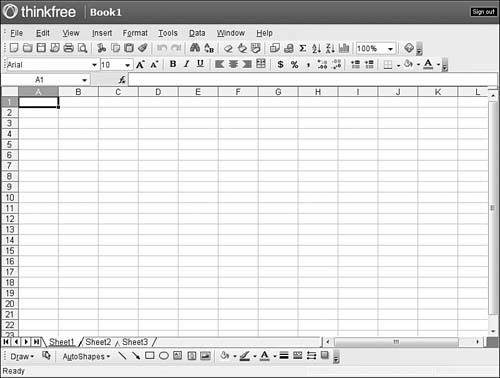 That lets ThinkFree offer a near-replica of the pre-2007 Excel interface, as you can see in Figure 10.  Each new spreadsheet opens in its own window. Use the toolbar buttons and pull-down menus to edit and format your spreadsheets. Figure 10. The Excel-like interface of ThinkFree Calc, a full-featured web-based spreadsheet. Unlike some of the previous applications, ThinkFree Calc is a full-featured spreadsheet program. You get lots of functions (300+), full formatting features, and a wide array of charts and graphs. It’s just like using Excel, except on the web. Sharing is accomplished via ThinkFree’s My Office Webtop, shown in Figure 11. Just pull down the menu next to the filename and select Share; you’re then prompted for the names of your desired viewers or collaborators (all of whom must be fellow ThinkFree users, of course). Those users can then access the spreadsheet via their own Webtop pages. Figure 11. 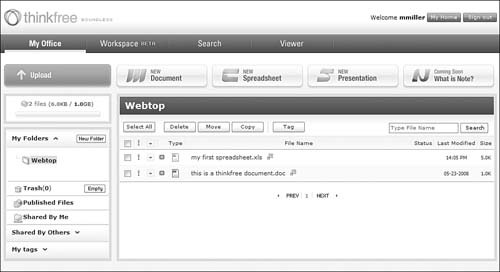 Sharing files via ThinkFree’s My Office Webtop. 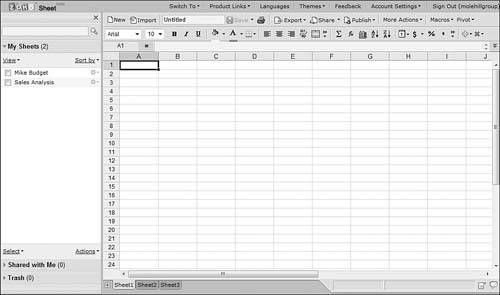 Zoho Sheet (sheet.zoho.com) is Zoho’s web-based spreadsheet application. Like all Zoho apps, this one is full featured with great sharing and collaboration features. As you can see in Figure 12, it is a lot like Google Spreadsheets. You get an Excel-like toolbar-based interface, multiple sheets in each file, a full load of functions, lots of different types of graphs, and all the formatting options you need to create great-looking printouts. The leftmost pane displays all your spreadsheet files, including those you’ve chosen to share with others. You can share your spreadsheets on either a read-only or read/write basis. You can also easily share files direct with designated groups of users. Figure 12. Last but not least, Zoho Sheet—a full-featured online spreadsheet application. Just as useful, Zoho Sheet enables you to export your web spreadsheets as Excel XLS format files, as well as files in a variety of other formats. You can also easily publish your web spreadsheets to your own website or blog; it’s a simple one-button operation. In short, even though Zoho Sheets comes last in the order of all these cloud spreadsheets, it’s among the first in terms of features and functionality. It’s definitely worth considering—especially if you have use for the other applications in the Zoho Office suite. You don’t have to use a web-based application to share your documents online. If you’re a die-hard Microsoft Office user, it’s good to know that Microsoft now lets you share any Office document via its Office Live Workspace tool. 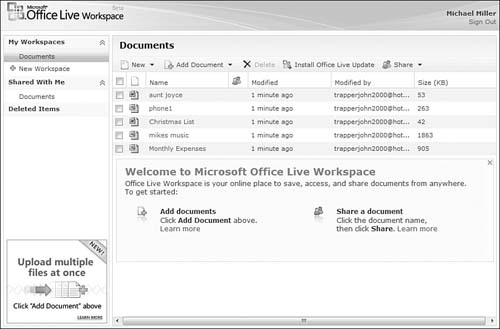 Office Live Workspace (workspace.office.live.com) enables any user to store a thousand or so Office documents online, for free. When the software extension is installed on your PC, you can easily upload and share your documents from within Microsoft Word, Excel, and PowerPoint. You can even use Office Live Workspace to synchronize your Outlook contacts, tasks, and events between different computers. Your uploaded documents are accessed from your main workspace, shown in Figure 13. From here, you can download documents to another computer or click the Share button to share selected documents (or your complete workspace) with other Office Live Workspace users. Figure 13. Microsoft Office Live Workspace—a way to share Office documents online without switching to a different web-based application. Office Live Workspace offers web-based document storage and sharing without the need for web-based apps. It’s a great way for Office users to share critical documents and group projects between multiple users.